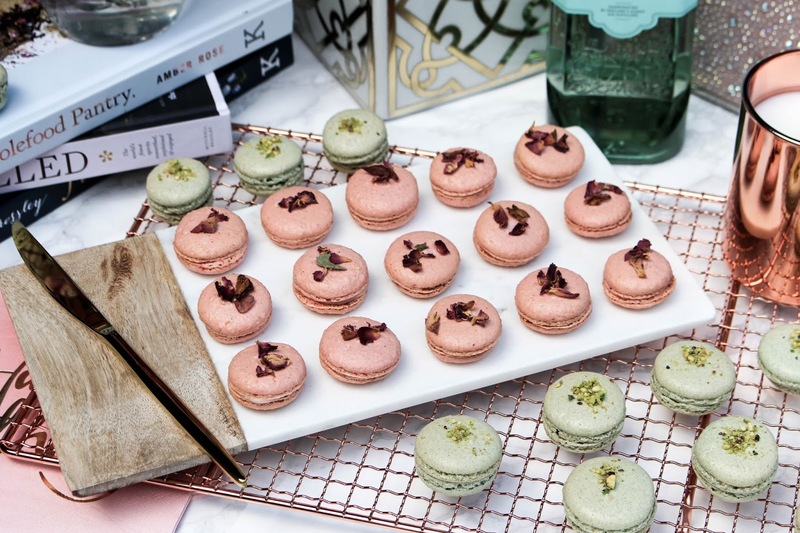 Mon Dessert Framboise Rose & Pistachio Macarons | Worldwide Giveaway! So I've been kind of MIA lately, though with pretty good reason. Guess who's just celebrated their 24th birthday?! 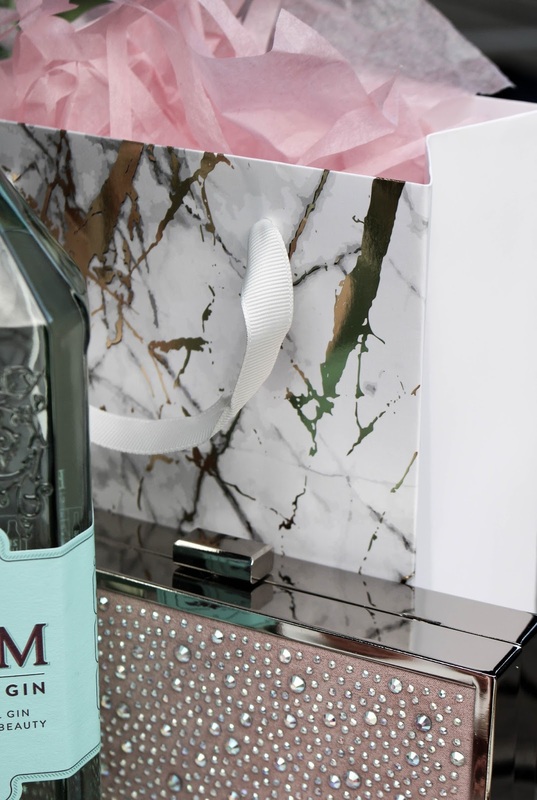 Similar to the beginning of a new year, birthdays give me such good vibes; it feels like a new chapter, and an excuse to set new goals (ahem, any excuse to write a list). Though before all else, my twenty-fourth year has started with macarons - lots of macarons. 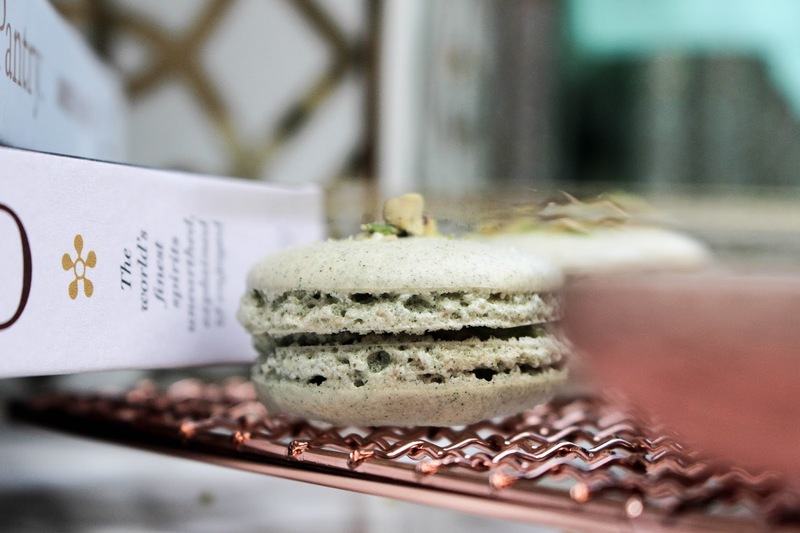 Having fallen in love with Mon Dessert's macaron making kits last summer, I'm revisiting the Brixton-based French patisserie again for dessert heaven - all in the name of celebrating! I've whipped up two batches of macarons, Framboise Rose and Pistachio, using the mini macaron-making kits. Like what you see? 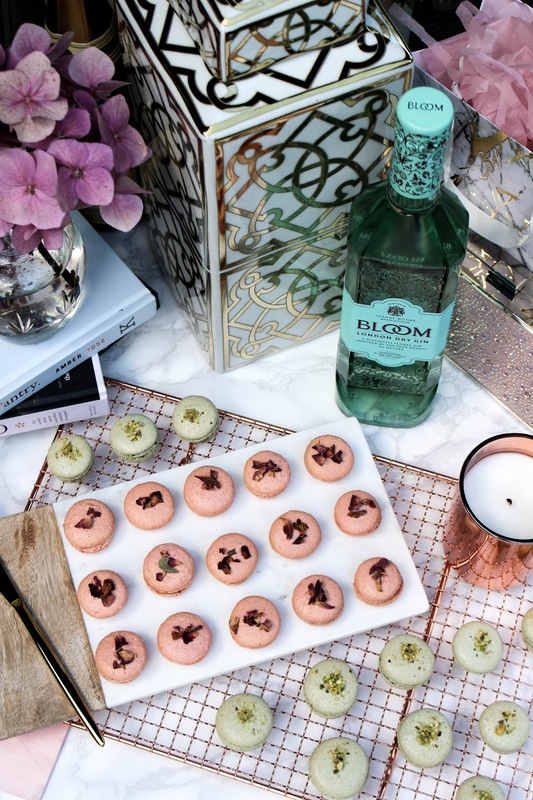 I've teamed up with Mon Dessert to offer one lucky reader of A Glass Of Ice the chance to win a Chocolat Noir & Gold Dust Macaron Kit and Pistachio Macaron Mini Kit. Scroll down to enter! I could tell you millions of times just how much I love the macaron making kits, but the ultimate stamp of approval comes from both Harrods and Fortnum & Mason. Honestly? I'm not surprised. The flavours are rich and beyond delicious, and the main kits provide practically everything you need to create approx. 24 macarons. Yum! 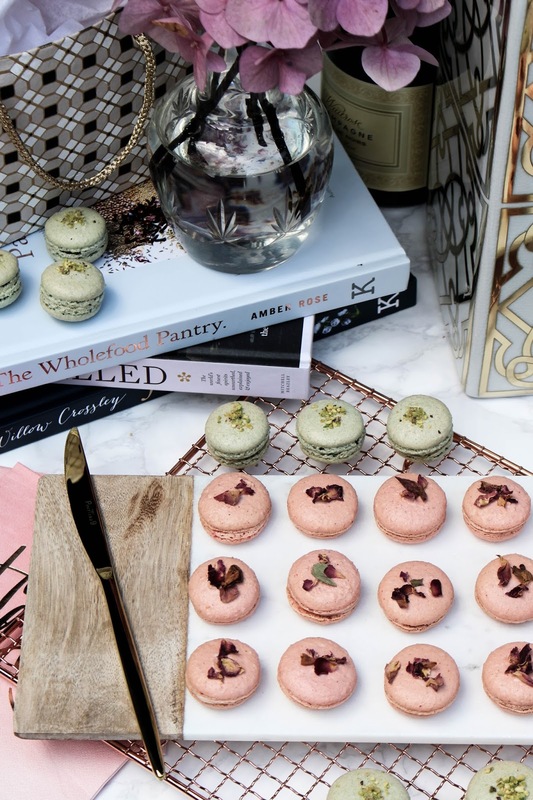 For those of us (intensely) interested in food styling, the 'cherry on the cake' comes in the form of petals, ground pistachio, gold dust etc ... on the macarons! 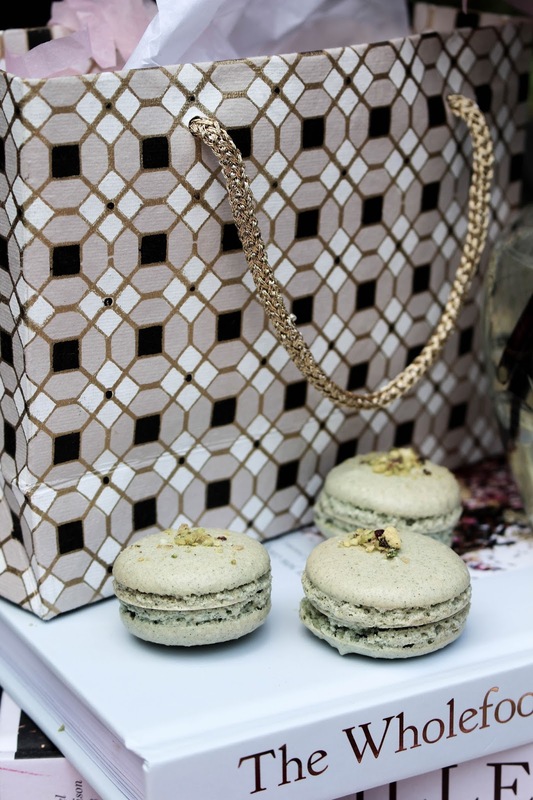 Okay, so now for the exciting part - your chance to win a Chocolat Noir & Gold Dust (full) macaron kit and Pistachio (mini) macaron kit. Mon Dessert use natural colours and both kits are gluten-free. The giveaway is open worldwide and will close at the end of September, and so you know what that means - cosy weekend baking sessions for the winner! My all-time favourite Mon Dessert macaron-making kit is Chocolat Noir & Gold Dust (<< spot the difference in my piping skills! ), though that's not to say the Pistachio edition's white chocolate ganache isn't 100% addictive. But don't take my word for it; you can decide which one you prefer when they arrive on your doorstep (wink, wink). Good luck to those entering the giveaway! Note: This prize has been provided by Mon Dessert. Happy birthday gorgeous ! Those look so delicious!!!!! Happy birthday to you! That giveaway is so delicious! Happy belated 24th! You've clearly started your new year right! These macarons look delicious and gorgeous. You always make me want to step up my photo game, and in this case, food photography game. You're just so good! Happy belated birthday beauty! I hope had a great bday party! These macarons look delicious! Happy belated birthday, I hope you had a really great day! Beautiful pictures too, they look amazing!! Oh gosh, have you turned 24? I remember you being 20 or 21 when I first followed you! Or is my memory failing me? Happy belated birthday, Gabrielle! Aww happy birthday Gabrielle!!! Hope you had the best birthday lovely! 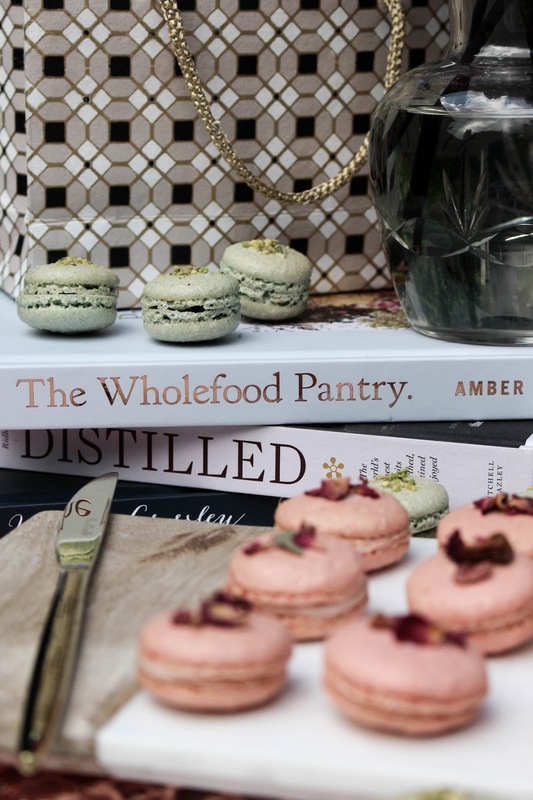 :) These macaroons look to die for - what a fabulous giveaway! Are the easy to make? Thanks Jasmine! Macarons are never easy to make, but this kit definitely takes the hassle out of figuring out the baking process. So much fun to use as well! Have a happiest birthday gorgeous, Gab! The pink and green macaroons look so cute! That's an awesome way to start your birthday, in my opinion. I love pistachio! Happy birthday, gorgeous. Keep blogging! Happy Birthday Gabrielle! These macarons look so delicious! Thanks so much Michaela - and wishing you a very, VERY happy birthday!! Great giveaway Gabrielle!! I love macarons and these ones look so delicious and stylish!! Those macarons look amazing! Hope you had a good birthday! Happy Saturday! Did you say I could make my own macaron really easy?? These seem like they worked really well. I tried a macaron making kit a while ago and they were really horrible. I am going to enter! What an awesome giveaway! The macarons look sooo good and you stylized the photos really well :3 Hope I win! This is a wonderful giveaway and I hope you had a wonderful birthday! The macarons look too tempting!! Happy 24th birthday babe! Hope you had a lovely time and these pictures are so wonderful as always. You are making me hungry ! Um ... What a delicious and sunny post! Congratulations on your last birthday! I wish you happiness, health, creative successes and all the best! And the photos are amazing! Thank you! Hope you had a lovely birthday Gabrielle! 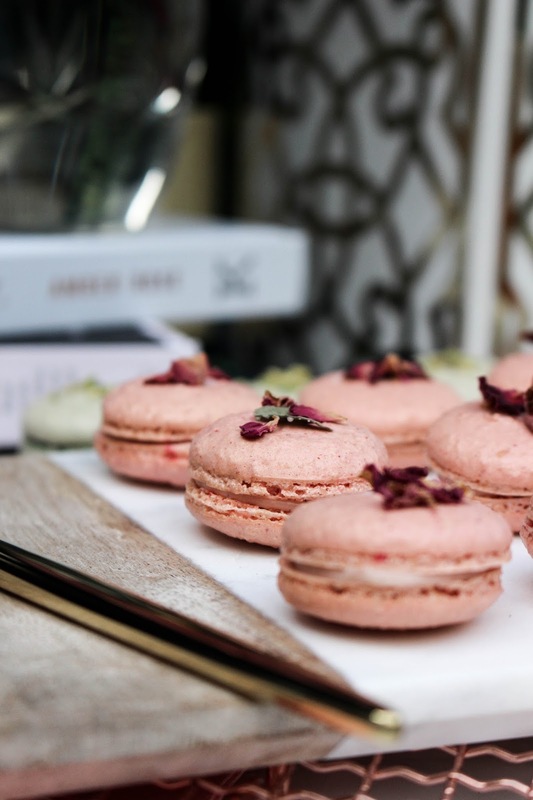 These macarons look incredible, so elegant but yummy! You've done a great job baking them perfectly and what a lovely prize now the weather will undoubtedly start getting a bit rubbish and we can stay indoors and spend some time in the kitchen! Happy 24th birthday Gabrielle! The macarons are sooo beautiful I want to have them all! Now these look incredible! Happy belated birthday! Aww Happy belated Birthday, Gabrielle! I wish you all the best in the world for this new chapter of your life! Thank you so much for extending your bday celebrations with us by hosting this yummy giveaway ;) I just entered! Hey! Happy Belated B-day! The macarons look yummy! Nice photos too! You know I've never had macarons...So yea, I've been told I'm missing out on...Life in general lol! 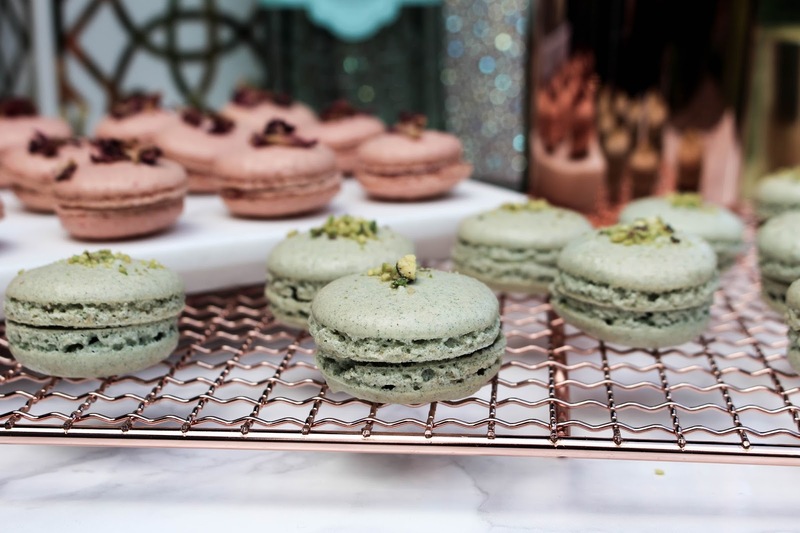 Beautiful photos and pistachio macarons are one of my favorite flavors! Happy belated birthday, I hope you had a really great day! Beautiful pictures ! Happy belated birthday, beautiful! 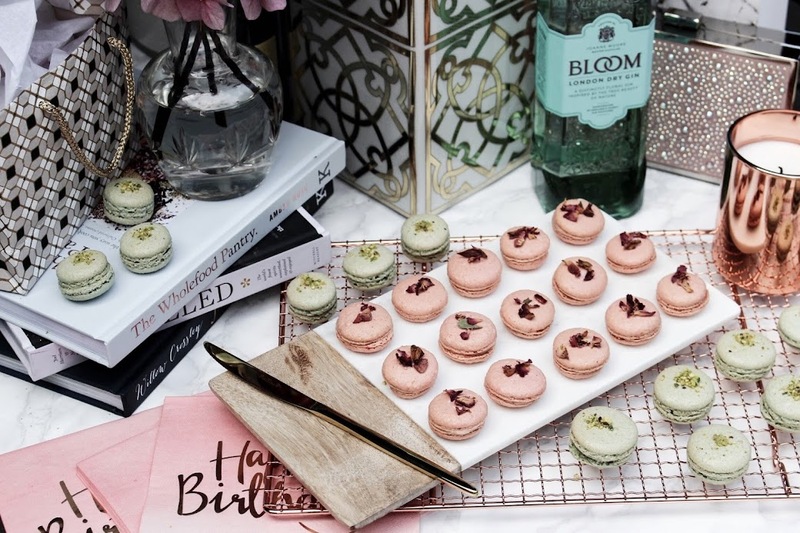 Birthdays are so special and important - celebrating with these delicious macarons sounds like the perfect way, right?! Happy birthday my dear Gabrielle and sorry for delay!!! I hope you had a very incredible and amazing best day! Your pictures are amazing as always. These macarons look insanely yummy! Happy birthday hun, hope you enjoyed that sweet feast. Happy Birthday in arrears, I do hope it was spent with fun and laughter. Warm wishes friend, and best wishes! First up, happy birthday! Ohmygoodness dude, that's so exciting. I have a question though, like we're blogger friends and yet I have no idea what you're doing or anything? Like do you work, or? And these macarons look delicious, I've tried to make my own but I'm terrible at it, maybe I'd have better luck if I did try a kit or the like haha. Hey Amy, this kit definitely takes the struggle out of making macarons! To answer your question, I tend to always have a few different projects on the go - right now, I'm writing, blogging, and also in the process of starting my first business. Hope you're having a lovely week! this looks amazing <3 Belated Happy birthday! Wow! Those macaroons look so surreal. I would munch on those in minutes! Ha! Happy Belated Birthday Gabrielle! Hope you had a fabulous day. Those macarons look absolutely delightful. Happy belated birthday! I didn't realize you are so close to my age (23)! Those macaroons look so good! I can't believe you made them! Yummy! I love macarons!! Mmmm, esp. pistachio. My favorite. I adore your photos....sooo pretty.